Get into action with our integration with Microsoft Teams in Office 365. 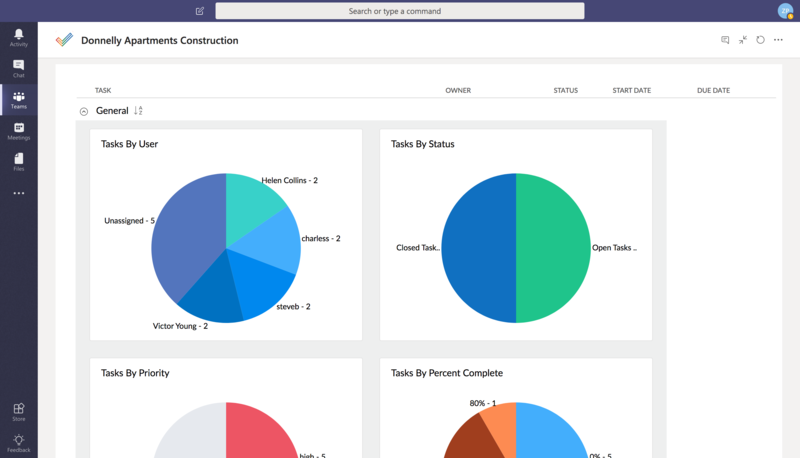 Microsoft Teams is an all-in-one hub for effective team collaboration. 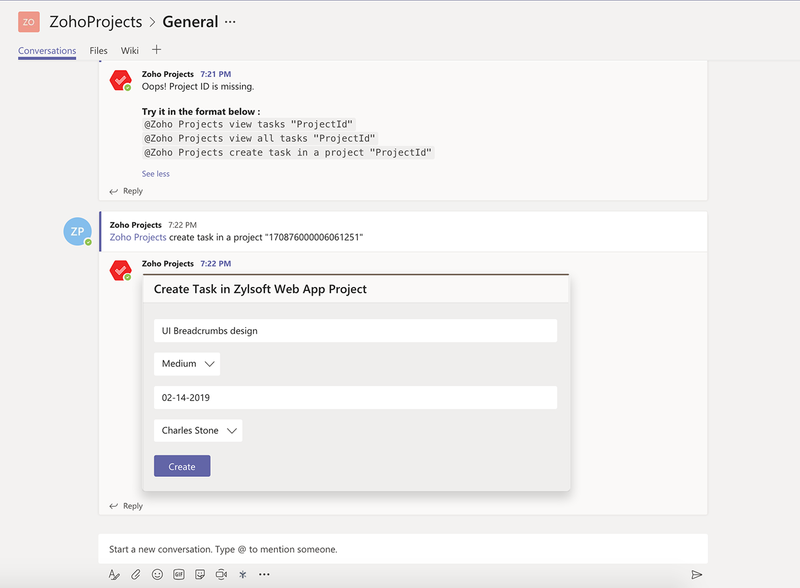 Teams users can add Zoho projects tab to their chat channels and start working on projects directly from the Teams workspace. 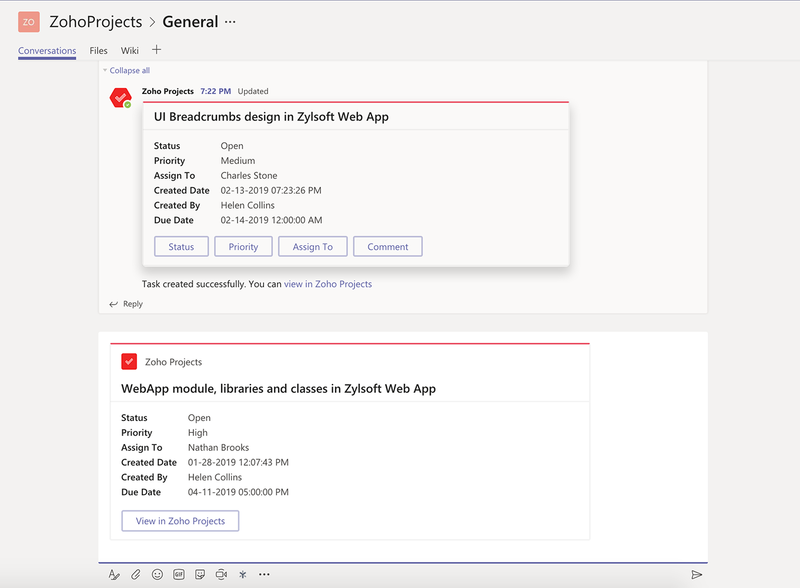 Only Microsoft Teams users who are a part of the Zoho Projects portal can access the project tabs. Collaborate with your teammates via chat. 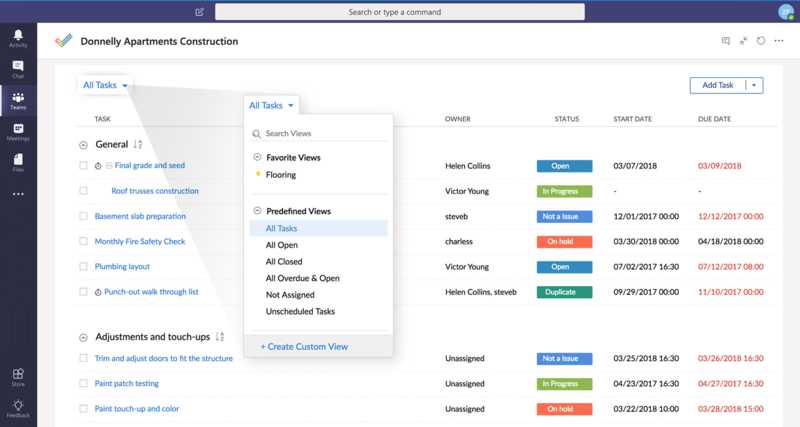 Add tasks and task lists to projects directly from the Teams workspace. Link tasks using four types of task dependency and establish task workflow. View task lists of the project while chatting with teammates about the tasks & project activities. Task list view displays the task owner, task status, start date, and end date for each task. 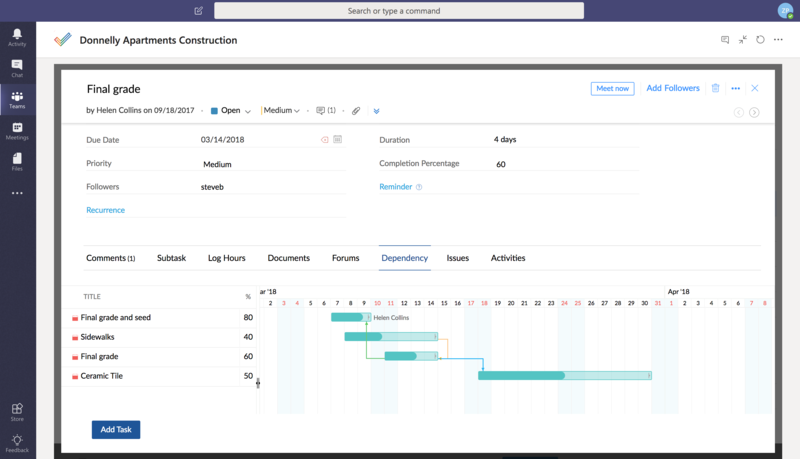 The chart view of the task list shows a graphical representation of the tasks by user, status, priority, and percent complete. Log in to your Microsoft Teams account in Office 365. Click the + button in the top of the channel to add a new tab. Click the Zoho Projects icon in the Add a tab pop-up. Link your Zoho Projects account to your Teams account (if you’re a new user, sign up for Zoho Projects and create your portal). Select your portal and choose the project you want to work on. You can keep adding more Zoho Projects tabs within your channel. Using the Zoho Projects bot, you can view all the projects or tasks in your portal, view their details and edit them, and create tasks in a project. Click Store and navigate to Bots. Select Zoho Projects bot and click Install. You will need to authorize your Zoho Projects account to link the bot. Click Authorize in the Zoho Projects bot. You can proceed with the same Zoho Projects account you are already logged in or you can log in using a different account. You are now ready to use the bot. You can type @Zoho Projects in your team’s Conversations tab and select the Zoho Projects bot. You will be prompted to select an action or you can type the action to view projects or tasks or create tasks. When you view tasks, you can edit the task details such as status, priority, task assignee, and comments. The actions you perform in your channel’s Conversation tab using Zoho Projects bot can be viewed by all the users in your team. However, if you want to view the projects or task details in private, navigate to Chat in MS Teams and click Zoho Projects private chatbot. You can set up portal and projects from your Zoho Projects private chatbot whereas you cannot do it from your channel’s Conversation tab. 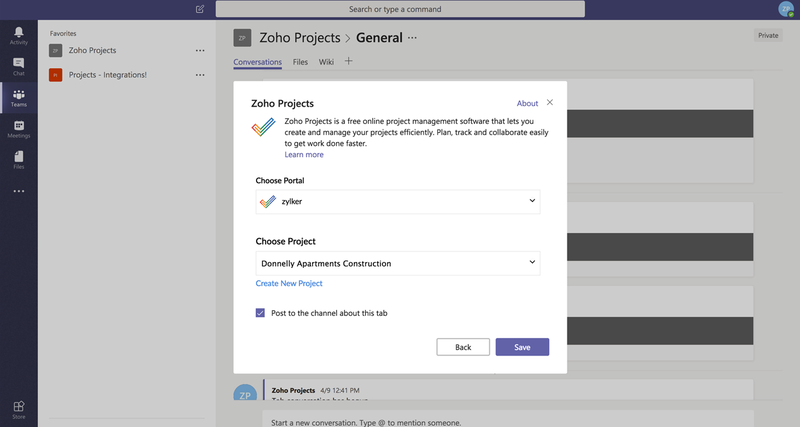 You can generate task preview from your channel’s Conversation tab or Zoho Projects private chatbot using our messaging extension in Microsoft Teams. Click " " below the text box. Search for the task you want to preview. Select the task and send messages along with it. 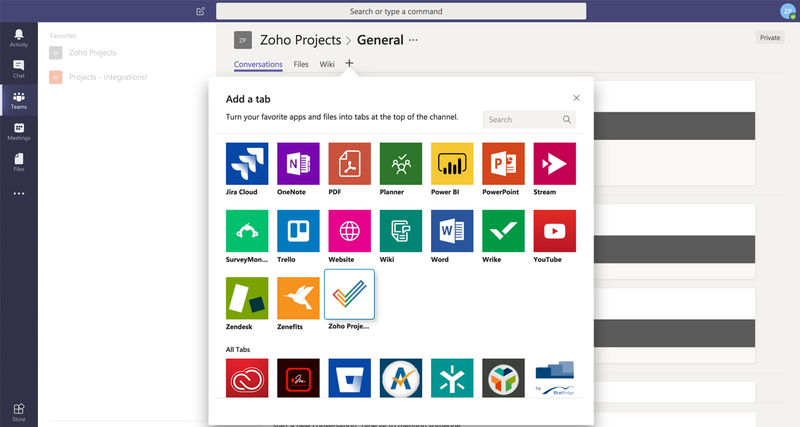 Start exploring Zoho Projects and Microsoft Teams integration! or Sign up for a new portal.